Why Don’t You Just Fix it? A few weeks ago, I discovered this sign hung above the toilet in the men’s room at a small cafe where I was having breakfast (email subscribers may have to open this post on the web to view the image). 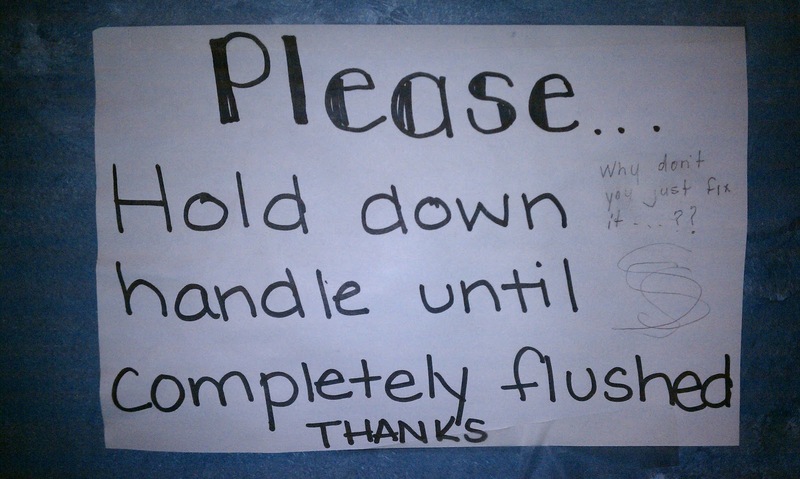 The original sign was apparently created by management of the cafe to address a problem with the toilet. Nothing terribly noteworthy about that. What caught my attention about this sign was the note written in by a patron in pencil on the right side. For those who can’t read it, it says “Why don’t you just fix it . . . ? ?” At first, this made me laugh a little bit. But, then I got to thinking about it. The people who run this cafe at some point realized that they have a toilet problem. They determined through some experimentation (I assume) that the toilet wasn’t flushing correctly. At this point, they had a choice. They could fix the toilet. But, that might take time and cost a little money. Alternatively, they could put up a sign informing those who use the toilet to take some extra action to ensure the toilet functions properly, effectively shifting the burden to their customers to make the toilet work. They chose the option that was less burden and cost to management at the detriment (albeit a minor one) to the customer. I wonder how often we do this in our own work. We don’t do it maliciously, but how frequently do we save ourselves time and money by shifting burden to our employees or customers? We shut down social media access to our employees because of what they might say about the company. If your company is doing things to employees that are so bad that you need to worry about this, why don’t you just fix it? We make customers click 6 times to get to what they want rather than getting there in one click because it would require some redesign. Why don’t you just fix it? We make employees type their resume details into an online job application when they could just send a resume or import their LinkedIn content. Why don’t you just fix it? We know that customers have a difficult time finding our store front because our sign isn’t visible from the main road, so we have to send out detailed directions on how to find us. Why don’t you just fix it? We know that everyone hates traditional performance appraisals: employees, managers, HR . . . everyone. We can’t find evidence they actually improve performance. And yet, we spend a lot of time and energy forcing people to do them. Why don’t you just fix it? Why don’t we just fix it? You control NOTHING. Get over it. Super post and I see business and personal implications. I love this post! I wrote something similar about a broken stapler in our office. It's crazy the time and resources we spend working around a problem — instead of investing in making sure things work as we intend. You should go back to see if they fix the toilet — or the sign!